Starting at Lava Point requires 2 cars or paid shuttle service. Most do it as a backpack, but it can be done as a long day hike. 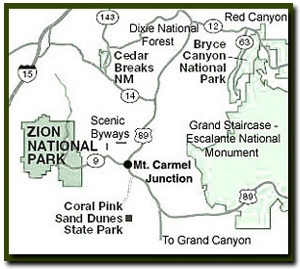 Most just begin in Zion Canyon and turn around at Cabin Spring to go back to the canyon. The paved path ascends a series of switchbacks that hug the side of a sun baked mountain, then winds through the coolness of Refrigerator Canyon. After leaving the shady reprieve the trail climbs twenty-one, steep man made, switchbacks called Walter's Wiggles. 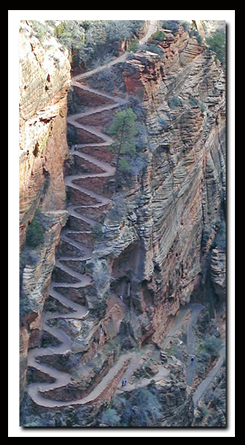 This short zigzagging section of the trail ascends steeply to Scout Lookout where it bypasses the Angels Landing spur to continue uphill to Cabin Spring or sometimes referred to as the West Rim Spring. At this point, the trail has ascended 2400 feet, past panoramic views, to Cabin Spring. Day Hike: Long day hike or a nice backpack. Permit: Permits are not needed for a day hike, but are needed for an overnight backpack. Difficulty: Strenuous, but this is a maintained trail. Sun Exposure: Full Sun most of the way, with shade in Little Siberia and Refrigerator Canyon. Trail Conditions: Well maintained. November to May a narrow upper section of the trail called "Little Siberia" is usually snow packed and dangerous and Lava Point is usually inaccessible in the winter. Trail Access: Usually from April 1st until October 30th Zion Canyon is accessed via the shuttle. Private cars are allowed in Zion Canyon the rest of the year. Park at the Zion Canyon Visitor Center to ride the shuttle and get off at the Grotto shuttle stop. The rest of the year, when the shuttles are not operating, drive into the canyon and park. Best Season: Mid-May after the snow clears from the trail and late spring when its cooler and the days are still long. November to May there may be snow and ice past Refrigerator Canyon. The snow is usually heavy in Little Siberia even if you can get past Refrigerator Canyon. Water: Usually available at Cabin Spring. Check at the Zion Canyon Visitor Center to see if the springs are flowing at the time of your planned hike. West Rim Trail History - The trail to Scout Lookout was built by the NPS in 1925-1926 and paved in 1929. Packhorses were used to haul 1240 gallons of oil, that was mixed with sand and rock to pave the trail. A hard surface is desirable on many of Zion's trails to prevent erosion and rutting. I have hiked Zion's southern most trails which are all dirt and the rutting from hikers trekking while its wet caused a multitude of deep holes. My feet had many blisters from those hikes. In the parks 1940's brochure they list this hike as a horse and foot path and horses would create a lot of rutting. In 1985 mules were used to carry material needed to resurface a great deal of the upper part of the West Rim Trail to Scouts Lookout. The animals got a rest when it came time to pour concrete on the path known as Walter's Wiggles when helicopters took up the task. In 2007 the NPS again used helicopters to update the path. They carried away the broken old surface and brought in supplies but the NPS decided not to repave the path above Scouts Lookout. Zion Photo: Walter's Wiggles are a creative section of the West Rim Trail that zigzaggs it way up to Scout Look. From there you can choose to hike the half-mile to Angels Landing or continue up the West Rim Trail. West Rim Trail Directions - From the Grotto picnic area, cross the road and walk over the foot-bridge to the West Rim - Angels Landing trailhead. Climb the sun drenched switchbacks up the steep path as they wind back and forth takers hikers higher and higher. Eyes gaze upon the beauty of Zion Canyon as they follow the Virgin River flowing at the base of the trail. Refrigerator Canyon - This is the part of the trail where hikers get a slight reprieve from the constant, steep grade of the West Rim Trail and the heat of the full sun. Towering canyon walls shade and cool the trail in this all too brief section. Walter's Wiggles - Squiggle the wiggles, as they ascend the steep twenty-one sharp switchbacks from the floor of Refrigerator Canyon to Scout Lookout. Few make it up this part of the route without stopping for a couple of breathers. The Walter's Wiggles section was named after the first superintendent of Zion National Park, who in 1924-1925, helped engineer the twenty-one switchbacks. Scout Lookout and Angels Landing - This is the 2-mile mark and the saddle at the junction of the Angels Landing and West Rim Trails. The views of Zion Canyon here are even more impressive than they were lower on the mountain. If you know where to look, several climbing routes can be viewed from this vantage point. There is a rest room at this junction, but during the last several years it seems to be out of order more than its working. If you have never been to the lofty perch of Angels Landing you should consider making your way along the half-mile fin. You return the same way you came, then continue your hike up the West Rim Trail. Cathedral Mountain - The trail turns north after Scout Lookout, crossing a slab of smooth bedrock. Follow cairns through this portion of the hike. Cathedral Mountain is the large mountain to the left when leaving Scout Lookout. Watch for cross-bedding along this trail, similar to that on Checkerboard Mesa. Little Siberia and Mount Majestic - Little Siberia is an open valley that gradually ascends into a small canyon north of Mount Majestic and eventually reaches the saddle between the West Rim and Mount Majestic. The saddle separates Little Siberia to the east and Behunin Canyon to the west. The dense vegetation that thrives in this cool valley includes big tooth maple, Douglas fir, spruce and gamble oak. In the winter this part of the trail may be impassible even with crampons or yak tracks. Switchbacks - Out of the shade of Little Siberia, the narrow trail continues upward on two long switchbacks hugging the tall sandstone wall. The head of the slot canyon named after a pioneer in the park, Behunin, is seen on the left. Note the views of Mystery Canyon as you continue your hike upward. Cabin Spring - Cabin Spring is just a little mud hole, but it does offer drinking water. The water seeps up from the ground but it must be filtered before drinking it. Longer hiking or backpacking options from this point are Lava Point via the West Rim Trail or the less scenic Telephone Canyon route. There use to be a NPS cabin, that burnt down in 1970, near the spring. which is how the spring got its name. Cabin Spring was named for a cabin that burned down in 1970. The name Telephone Canyon was used because in the past there was actually a telephone line from Lava Point down to the Temple of Sinawava in Zion Canyon. 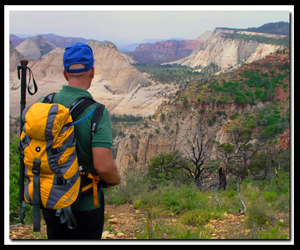 Best Trail Features - From Scout Lookout many landmarks of Zion National Park can be seen including the Virgin River, Big Bend, the Organ, Cathedral Mountain, Observation Point and Cable Mountain. Past Scout Lookout is Behunin Canyon and Mystery Canyon. Cabin Spring - Named for a park service cabin that burned down in the 1970s. The spring is often called West Rim Spring since the cabin burned down.